A vast empty Western landscape. The camera pans across it. Then the shot slides onto a sunburned, desperate face. The long shot has become a closeup without a cut, revealing that the landscape was not empty but occupied by a desperado very close to us. In these opening frames, Sergio Leone established a rule that he follows throughout "The Good, the Bad and the Ugly." The rule is that the ability to see is limited by the sides of the frame. At important moments in the film, what the camera cannot see, the characters cannot see, and that gives Leone the freedom to surprise us with entrances that cannot be explained by the practical geography of his shots. There is a moment, for example, when men do not notice a vast encampment of the Union Army until they stumble upon it. And a moment in a cemetery when a man materializes out of thin air even though he should have been visible for a mile. And the way men walk down a street in full view and nobody is able to shoot them, maybe because they are not in the same frame with them. Leone cares not at all about the practical or the plausible, and builds his great film on the rubbish of Western movie cliches, using style to elevate dreck into art. When the movie opened in America in late 1967, not long after its predecessors "A Fistful of Dollars" (1964) and "For a Few Dollars More" (1965), audiences knew they liked it, but did they know why? I saw it sitting in the front row of the balcony of the Oriental Theatre, whose vast wide screen was ideal for Leone's operatic compositions. I responded strongly, but had been a movie critic less than a year, and did not always have the wisdom to value instinct over prudence. Looking up my old review, I see I described a four-star movie but only gave it three stars, perhaps because it was a "spaghetti Western" and so could not be art. But art it is, summoned out of the imagination of Leone and painted on the wide screen so vividly that we forget what marginal productions these films were--that Clint Eastwood was a Hollywood reject, that budgetary restraints ($200,000 for "Fistful") caused gaping continuity errors, that there wasn't a lot of dialogue because it was easier to shoot silent and fill the soundtrack with music and effects. There was even a pathetic attempt to make the films seem more American; I learn from the critic Glenn Erickson that Leone was credited as "Bob Robertson" in the early prints of "Fistful," and composer Ennio Morricone, whose lonely, mournful scores are inseparable from the films, was "Dan Savio." Even Eastwood's character, the famous Man With No Name, was an invention of the publicists; he was called Joe in the first movie, Manco in the second, and Blondie in the third. Perhaps it is the subtly foreign flavor of the spaghetti trilogy, and especially the masterpiece "The Good, the Bad and the Ugly," that suggests the films come from a different universe than traditional Westerns. Instead of tame Hollywood extras from central casting, we get locals who must have been hired near the Spanish locations--men who look long-weathered by work and the sun. Consider the legless beggar who uses his arms to propel himself into a saloon, shouting, "Hand me down a whiskey!" John Ford made Monument Valley the home turf of his Western characters, and he made great films there, but there is something new and strange about Leone's menacing Spanish vistas. We haven't seen these deserts before. John Wayne has never been here. Leone's stories are a heightened dream in which everything is bigger, starker, more brutal, more dramatic, than life. Leone tells the story more with pictures than words. Examine the masterful scene in the cemetery. A fortune in gold is said to be buried in one of the graves, and three men have assembled, all hoping to get it. The actors are Clint Eastwood (the Good), Lee Van Cleef (the Bad), and Eli Wallach (the Ugly). Each man points a pistol at the other. If one shoots, they all shoot, and all die. Unless two decide to shoot the third man before he can shoot either one of them. But which two, and which third? Leone draws this scene out beyond all reason, beginning in long shot and working in to closeups of firearms, faces, eyes, and lots of sweat and flies. He seems to be testing himself, to see how long he can maintain the suspense. Or is it even suspense, really? It may be entirely an exercise in style, a deliberate manipulation by the director, intended to draw attention to itself. If you savor the boldness with which Leone flirts with parody, you understand his method. This is not a story, but a celebration of bold gestures. Eastwood, 34 when he first worked with Leone, already carried unquestioned authority. Much is made of the fact that he came from television, that he starred in "Rawhide," that in those days it was thought that a movie audience wouldn't pay to see an actor it could watch for free. Eastwood overcame that jinx, but not any actor could have done it--and not with any director. He says he took the roles with Leone because he wanted to make movies and Hollywood wouldn't hire him. Yes, but Eastwood himself was to become an important director, and even then he must have sensed in Leone not just another purveyor of the Italian sword-and-sandal epics, but a man with passion. Together, Leone and Eastwood made The Man With No Name not simply bigger than a television star, but bigger than a movie star--a man who never needed to explain himself, a man whose boots and fingers and eyes were deemed important enough to fill the whole screen. I wonder if Eastwood's character has a tenth as much dialogue as Tuco, the Eli Wallach character. The Man With No Name never talks; Tuco never stops. This is one of Wallach's inspired performances, as he sidesteps his character's potential to seem ridiculous, and makes him a desperate, frightened presence. When he makes a clown of himself, we sense it is Tuco's strategy, not his personality. Trained in the Method, a stage veteran, Wallach took this low-rent role seriously and made something evocative out of it. Lee Van Cleef, as Angel Eyes, was New Jersey-born, already a veteran of 53 films and countless TV shows, many of them Westerns (his first movie credit was "High Noon," where he played a member of the gang). In a movie with a lot of narrowed eyes, he has the narrowest, and they gleam with insane obsession. All three men are after the fortune in Civil War gold, and the secret of its location is parceled out among them (one knows the cemetery but not the grave, the other knows the name on the tombstone but not the cemetery). So they know that they will remain alive until the grave is found, and then it is likely that each of them will try to kill the others. In a film that runs 180 minutes in its current restored version, that is not enough plot, but Leone has no shortage of other ideas. There is the opening shootout, involving unrelated characters. There is the con game in which Wallach plays a wanted man, Eastwood turns him in for the reward, and then Eastwood waits until he is about to be hanged and severs the rope with a well-aimed shot. There is the magnificent desert sequence, after Eastwood abandons Wallach in the desert, and then Wallach does the same to Eastwood, and the sun burns down like a scene from "Greed." There is the haunting runaway wagon, filled with dead and dying men. And, surprisingly, there is an ambitious Civil War sequence, almost a film within a film, featuring a touching performance by Aldo Giuffre as a captain in the Union Army who explains his alcoholism simply: the commander who has the most booze to get his troops drunk before battle is the one who wins. His dying line: "Can you help me live a little more? I expect good news." Sergio Leone (1929-1989) was a director of boundless vision and ambition, who invented himself almost as he invented the spaghetti Western. Erickson, whose useful essay on the trilogy is at www.DVDtalk.com, notes that Leone hyped his own career "by claiming to be the assistant director on Robert Aldrich's Italian production of 'Sodom and Gomorrah' (1962), even though he was fired after only a day." Leone made a forgotten Roman Empire epic in 1961, and then based "A Fistful of Dollars" so closely on Akira Kurosawa's samurai film "Yojimbo" that perhaps Gus Van Sant's shot-by-shot remake of "Psycho" (1998) was not the first time the technique was tried. A man with no little ideas, Leone made two other unquestioned masterpieces, "Once Upon a Time in the West" (1968) and "Once Upon a Time in America" (1984). By the end of his career, Hollywood was suspicious of films with long running times, and criminally chopped "America" from 227 minutes to a sometimes incomprehensible 139. 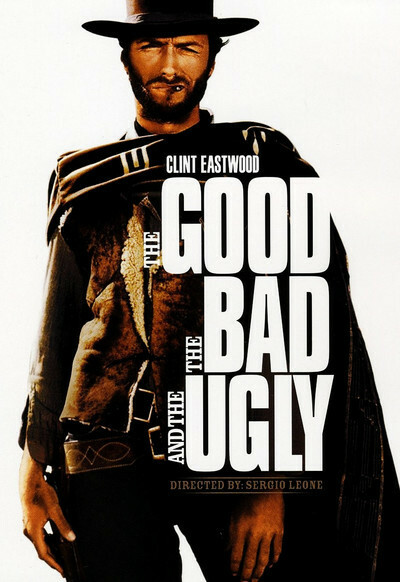 Nineteen minutes were cut from the first release of "The Good, the Bad and the Ugly." But uncut versions of all of his films are available on DVD, and gradually it becomes clear how good he really was.